There are many recent pictures of the church on the web, it seems to be a favourite subject for photographers. Older pictures are rarer. Some of these pictures, in very poor condition, were on display in the Green man until recently. Click on the pictures for larger versions. 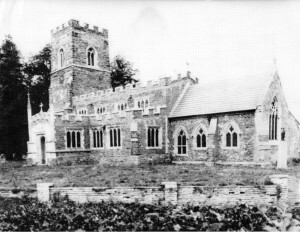 The picture above is the oldest photograph found so far of the exterior. The iron railings were removed at some time and are still missing today. Any idea when? Any idea of the photo date? 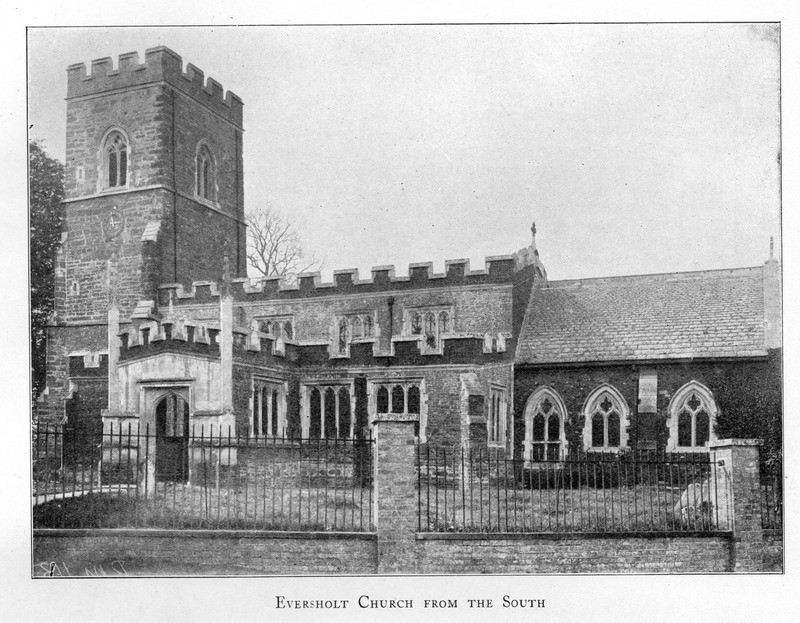 A copy of this picture was in the Green Man, but this particular version is scanned from A History of the County of Bedfordshire, first published in 1912 and now out of copyright, so this image is placed in the public domain. So, presumably, this image was made before 1912. 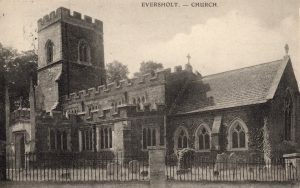 The hand-coloured postcard above is one of the E R Lovell series. 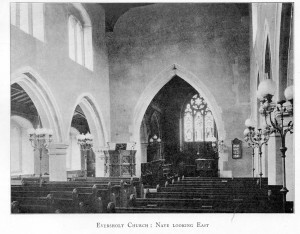 It shows the church at around the same time as the first photo. Can we date it exactly by the gravestones standing? The presence of this photo here follows a long and unlikely trail. I (EJW) was sent an automatic alert by Ebay about a copy of the postcard for sale. Too cheap to pay for it, I wrote a plea to eversholt-news@googlegroups.com that someone buy it. Niki Cardwell and Robert Berkeley were discussing who was going to buy it when Venetia Barrington piped up that her friend Ros had a copy and might lend it! Venetia asked Ros, who did kindly lend her card for copying. Venetia then bumped into Robert Berkeley and gave him the card. Robert Berkeley visited me to borrow some screwdrivers and brought the card. I scanned it, and … voila! It’s that communication and community and helpfulness and downright niceness that this site is all about. Thank you, everyone! 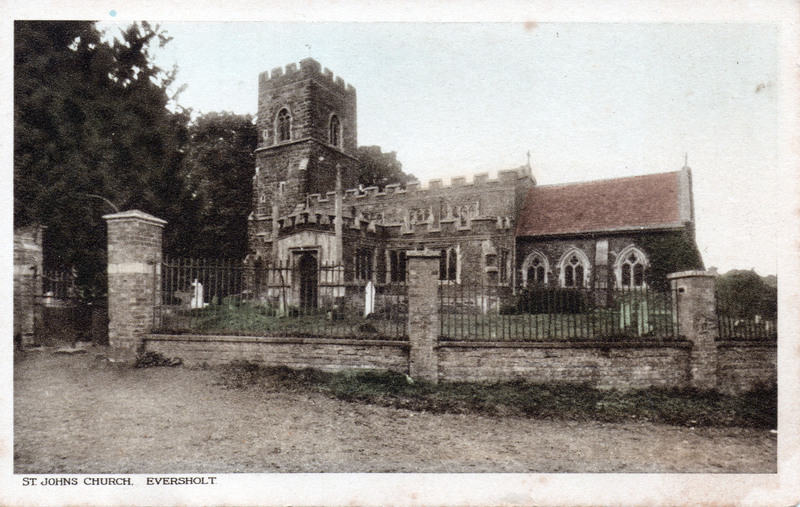 Looking carefully at the above two pictures (click each one for a much bigger copy), one can see that the postcard shows a bright white gravestone in the centre which is entirely missing from the top picture. 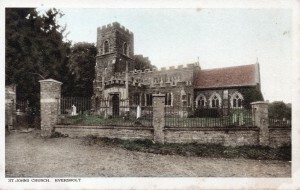 The two gravestones to the right of the postcard, in front of the rightmost church window, are upright in the postcard, but they lie askew in the top picture. 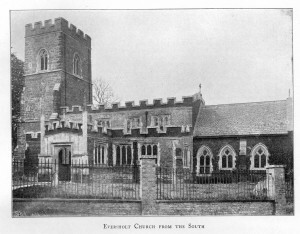 There’s a little more ivy on the right hand end of the church in the postcard, and the bushes in front of the church windows are a little taller in the postcard. 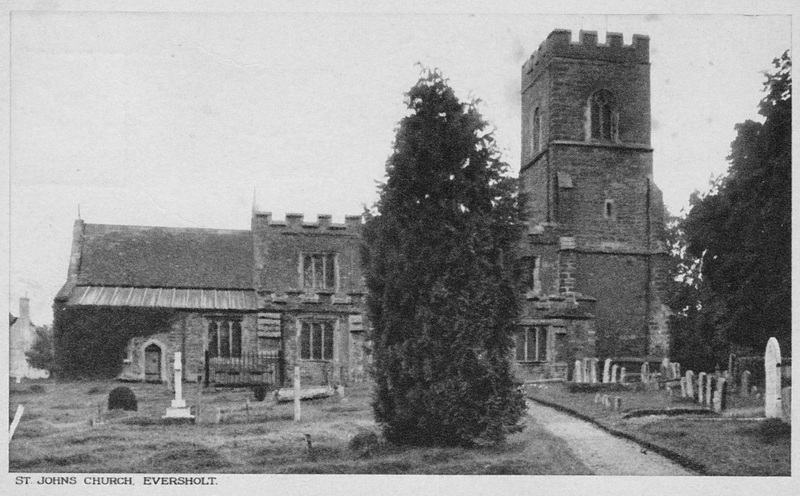 A reasonable guess is that the postcard image dates from a year or two after the top image, and in the meantime someone had installed the bright white gravestone and righted the two skew gravestones. 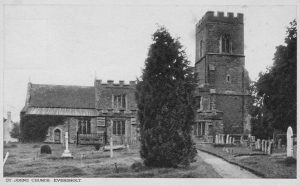 Unfortunately, the gravestones are no longer present, so we can’t use the date of the white gravestone to date the picture. Here’s another candidate for oldest picture: A postcard from a slightly different angle, also shown on the Postcards page. I haven’t yet worked out whether that is earlier than the other pictures. It’s certainly from before 1907, when the postcard was sent. This photo was taken some time after 1922, when the war memorial was installed. The railings have been removed and the chancel re-roofed. Any better ideas? Neither of the above two photos show the weather vane which now stands on top of the tower. When was that installed? Here’s another postcard, from the other side of the church. The railings have gone and the weather vane is present. When was it? 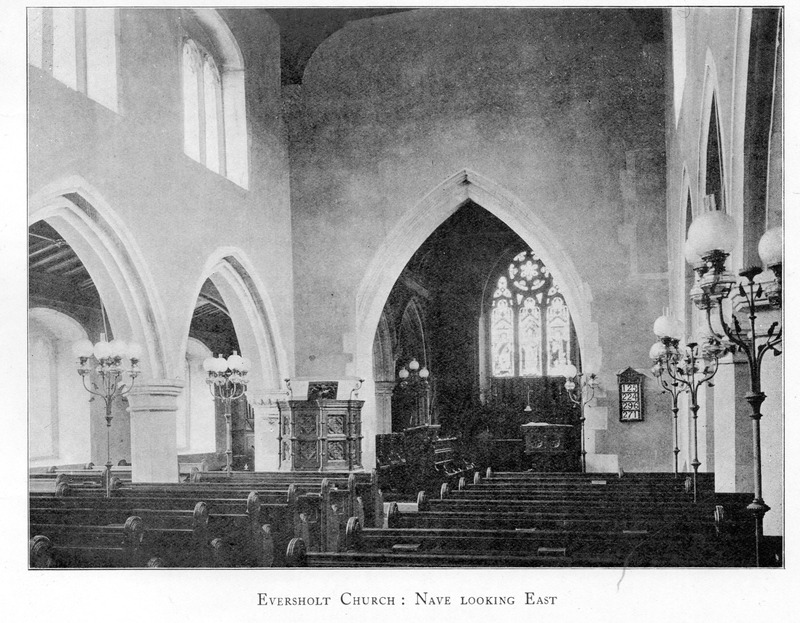 This is the earliest picture found so far of the interior. There don’t seem to be any pictures on the chancel arch or the walls. Anna Blomfield suggests that the pictures on the walls visible in the photo below were installed around 1900. This is another image that was on display in the Green Man, but actually turns out to be copied from A History of the County of Bedfordshire and is thus placed in the public domain. 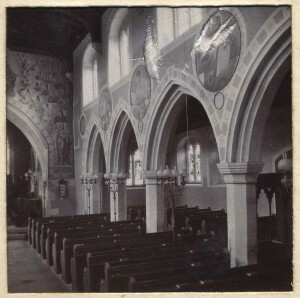 This photo was taken by A T W Penn, probably around 1915, and does show the wall paintings. Keeping the churchyard neat is a perennial problem. This is how it used to be done, which looks jolly hard work! 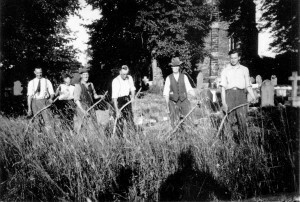 Don Impey thinks these people were (left to right) Mick Ryan, ?, Ben Oakley, ?, Pat Barr, with the date being in the 1930s.